Bacall enjoyed a fairytale career beginning with a hit movie and lasted right up until her death. Of course, no lines she ever uttered would ever grab as much attention as what she purred in ‘To Have and Have Not”. “You don’t have to say anything, and you don’t have to do anything. Not a thing. Oh, maybe just whistle. You know how to whistle, don’t you, Steve? You just put your lips together and blow.” She worked with co-stars that reads like nothing more than a who’s who list in Hollywood. Her resume’ lists some remarkable films that any classic movie buff has seen countless times. ‘The Big Sleep‘, ‘Key Largo‘, ‘Designing Woman‘ and ‘Murder on the Orient Express‘ are among some of the most synonymous films that immediately come to mind when Bacall is mentioned. In addition to her career in film, she was a long-time supporter and participator in the performing arts. Theater gave her more recognition with Tony awards whereas Hollywood waited until 1997 to give her a first nod towards an Oscar. She received an Honorary academy award in 2009. Bacall made headlines during the late 40’s while the House Un-American Activities Committee investigated Americans suspected of Communism, she and other actors took a trip to Washington to protest the activities with other known actors such as Bogart, Danny Kaye, John Garfield, Gene Kelly, John Huston, Ira Gershwin and Jane Wyatt. Among other moments that stand still in time for the actess’ life is the origination of the Rat Pack. Not the finished version most remember consisting of Sammy Davis, Jr, Frank Sinatra, Joey Bishop and Peter Lawford, but the original Rat Pack that focused on Humphrey Bogart, Sinatra, Irving Paul Lazar and their other close friends. She is also notably attached with Bogart, to a kind of vocal disorder that was named after the pair, Bogart-Bacall syndrome or BBS for short is a form of muscle tension dysphonia most common in professional voice users (actors, singers, TV/radio presenters, etc) who habitually use a very low speaking pitch. BBS is more common among women than men and has been blamed on “social pressure on professional women to compete with men in the business arena”. 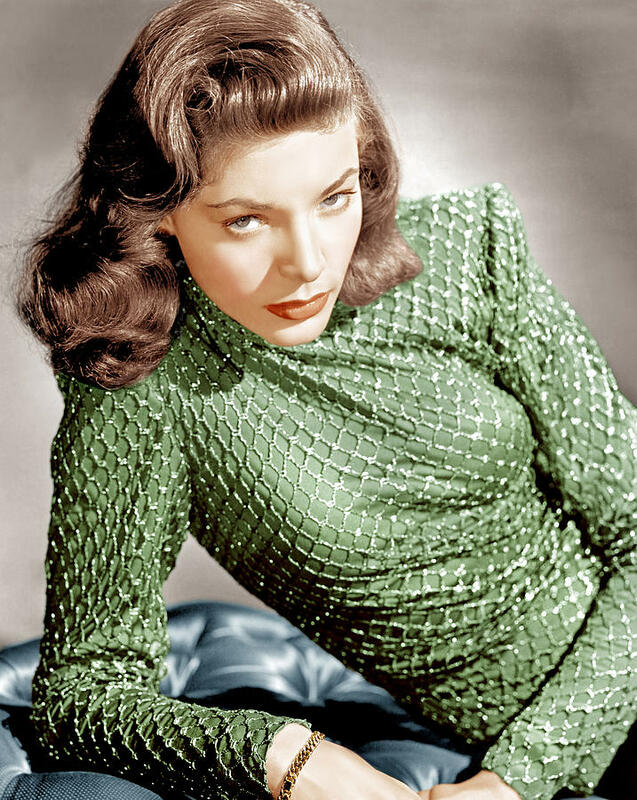 Another notable point for Bacall was that she was the only surviving legend mentioned in a popular phrase from Madonna’s 1990 #1 hit song ‘Vogue’. Of the legends she mentions, Marilyn Monroe, James Dean, Grace Kelly, Jean Harlow, Fred Astaire, Rita Hayworth and Bette Davis had all passed away before the release of the song and she was the surviving icon among names Greta Garbo, Marlene Dietrich, Joe DiMaggio, Marlon Brando, Gene Kelly, Ginger Rogers, Katharine Hepburn and Lana Turner who have all passed away since the song released. There was another song that featured her name that was performed by Madonna when she starred in the film version of musical ‘Evita’. Brought about by the legendary duo of Tim Rice and Andrew Lloyd Weber was the line from the song ‘Rainbow High’ “I’m their savior! 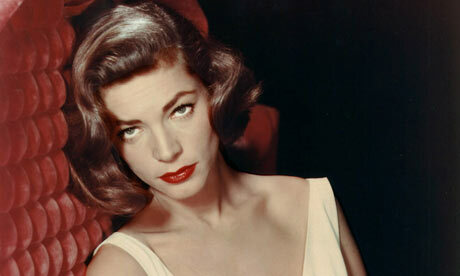 That’s what they call me, so Lauren Bacall me. anything goes!” This is the line that plays on repeat in my head anytime I hear the name Lauren Bacall. As much as she hated the term ‘legend’ she embodied the term along with icon, star, sultry and many others. While she may not enjoy the lifetime of association with Bogart, that was a part of her life and part of what the public remembers of her. She led such a remarkable life both on stage, on film and in private. Perhaps now, we can focus on her talents and impressive body of work. « Podcast #39 – TCA 2014/Comic Con 2014/Talking Animals! !